Arrived at Marrakech, Reception by our staff, check at the hotel/std Riad. Early departure by Minibus towards the city of Demnate and the natural bridge of Imi n’Ifri (1100m). Long passages on the side before the ascension of our first pass the tizi n’Amarskine (2012m). Descent to Imi n’Waqqa (1817m) through many Berber villages. Night at a bed and breakfast. 150 km transfer. 38 km of mountain biking. Elevation: 1390m –690m.Early departure by Minibus towards the city of Demnate and the natural bridge of Imi n’Ifri (1100m). Long passages on the side before the ascension of our first pass the tizi n’Amarskine (2012m). Descent to Imi n’Waqqa (1817m) through many Berber villages. Night at a bed and breakfast. 150 km transfer. 38 km of mountain biking. Elevation: 1390m –690m. Passing the village of Tarbat n’Tirsal and mounted to cross the Tizi n’Tighist (2400) famous for its rock carvings rupestre. Very nice down to Abachkou (1750 m), hilly terrain of dazzling colors. We along Assif Ait Boulli Aguersif up before climbing to Agouti (1760m) the first village in the valley of Ait Bouguemez. Night and Breakfast Homestay in the heart of Happy Valley or camp. 51 km of mountain biking. Elevation: 1450 m-1350m. 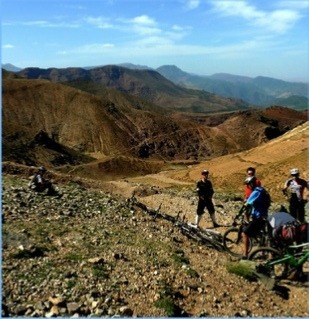 We mount our bikes to explore the supper valley of Bouguemez to Ifrane. The pass Tizi’n Tirghist (2629m), the view is breathtaking and the massive M’Goun casting Green Happy Valley against the bottom. After the pass Tizi’n Tsala n’Imenaïn, beautiful descent into the valley Assamsouq. Arriving at the collar, a stunning descent of about 1000m leads us to the village of Zawyat Ahansal night homestay. 71 km mountain bike. Elevation: 1380m –1700m. 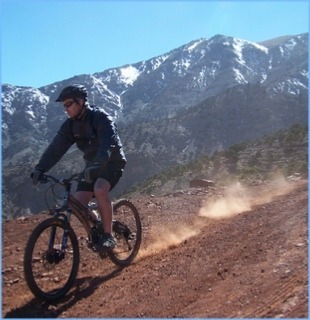 Mountain bike, we go down the beautiful river Zawyat. From time to time, against the bottom we find a few villages with “Tighremt (fortified houses). We turn to the right bank to begin a gradual ascent on a mountainside. At the height of our ascent, we see behind us the impressive cirque Taghia. In front of us, the imposing Rock Mestefrane, more known as the “Cathedral.” Beautiful winding descent to the bottom of the valley along the river to the village of Imi n’Ouareg. We enter the Assif Melloul. 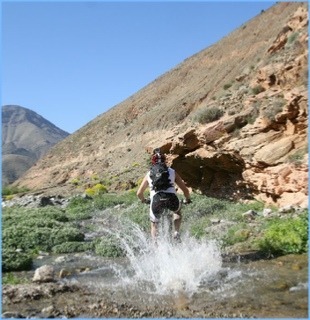 In a wild atmosphere in a narrow gorge, our route follows a path carved into the rock that rises progressively along the river. Days by chance, we met with the surprising colonies Macaque monkeys who take refuge in the cliffs. After our ride, we reach the village of Anergui that appears at the exit of the gorge. We can go and discover this beautiful region upstream of the village along the Assif Melloul “White River” with beautiful villages in the middle of yellow, red and green. Overnight lodging at Anergui. 74 km of mountain biking. Altitude difference: +1260m –1370m. A wild route to the heart of Assif Melloul. A steep trail leads high on the ridges to the pass Col Roud N’ Iroul (2480 m). Crossing highland territories nomadic before discovering the villages of altitudes Tasrafte into Ait Abdi and Imilchil and lakes legendary night in bed in front of Lake Tislit or camp. 50 km of mountain biking. Elevation: 1000m –1000m. Marrakech – After breakfast, transfer to Airport. End of our services.